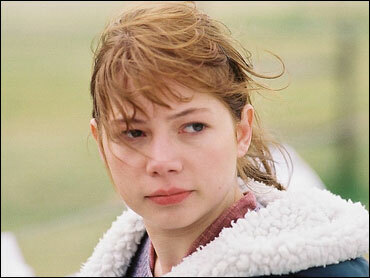 With "Brokeback Mountain," Michelle Williams graduates from teen idol to serious actress. She is nominated as best supporting actress for her portrayal of Alma, a young cowboy's wife who slowly realizes that her husband's heart belongs to another cowboy. In real life, she lives with Heath Ledger, the movie's Ennis del Mar, and their baby daughter in Brooklyn, N.Y.
See Michelle Williams for a brief bio and more pictures. Watch The Early Show contributor Jess Cagle's report on an unconventional love story. She is from cowboy country originally, though. Born Sept. 9, 1980, in a small town in Montana, she reportedly graduated from high school at age 15, gained legal emancipation from her parents and moved to Hollywood to start her acting career. In 1998, Williams won a regular role as Jen Linley on "Dawson's Creek," the WB network series. By 1999, she was popping up on teen magazine "hot lists." Trump pushes back on impeachment: "There were no crimes by me"
Church fires and arson: How safe is any house of worship? Democrats are debating if there is enough information in the Mueller report to begin impeachment proceedings against President Trump. Meanwhile, Mr. Trump's attorney said it was not against the law to receive information from Russia during the 2016 campaign. CBS News White House correspondent Paula Reid joined CBSN to break down the latest.